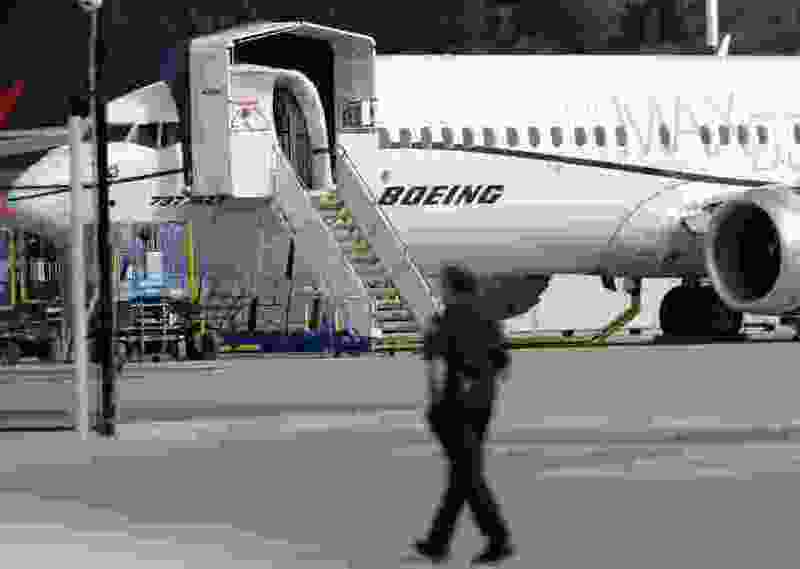 (Ted S. Warren | Associated Press file photo) A worker walks next to a Boeing 737 MAX 8 airplane parked at Boeing Field in Seattle. U.S. prosecutors are looking into the development of Boeing's 737 Max jets, a person briefed on the matter revealed Monday, the same day French aviation investigators concluded there were "clear similarities" in the crash of an Ethiopian Airlines Max 8 last week and a Lion Air jet in October. Washington • U.S. prosecutors are looking into the development of Boeing’s 737 Max jets, a person briefed on the matter revealed Monday, the same day French aviation investigators concluded there were “clear similarities” in the crash of an Ethiopian Airlines Max 8 last week and a Lion Air jet in October. The Justice Department probe will examine the way Boeing was regulated by the U.S. Federal Aviation Administration, said the person, who asked not to be identified because the inquiry is not public.